I love quick and easy soups especially when this is such a busy time of year. I made this soup in the morning and put it in the crockpot on warm all day. I took a little bite before I put it in the crockpot and I feel in love. This soup was so yummy! I couldn’t wait to come home from being busy all day and eat this delicious soup with my family. This was a hit! Everyone in my family loved it and my sister begged me to take the rest home to her a hubby. This is a soup recipe I will be making over and over again! Things that I would do differently next time: Possibly add one more can of the diced tomatoes. I love diced tomatoes. In a 2 quart saucepan, cook the ground beef and drain the fat. Add the remaining ingredients into the saucepan. Cook for about 8 - 10 minutes until thoroughly heated through. At this point I kept warm in crockpot for a few hours. Serve with sharp cheddar cheese on top and crushed tortilla chips. Sounds like yummy comfort food for a chilly day. A variation of this is in my slow cooker now. I cooked diced onion & minced garlic while browning the ground beef, added a can of rinsed/drained pinto beans, & reduced the milk to 1/2 cup for a yummy dip. Thanks for sharing this recipe! Oh my gosh that sounds so amazing!!! I MUST try that next time! Lindsay you are awesome!! Thank you! This was a huge hit tonight for supper! Even my 2 year old liked it. I added black beans, corn, and a little vegetable broth to thin it out. So good! Very good soup: just the right amount of spices (warmth not heat) and flavor. I used a package of fajita seasoning which I had on hand, 1 1/2 pounds of ground beef, and probably more than 3/4 cup sharp cheddar. Just made this tonight……..easy and yummy! A keeper! Where do you find the nacho cheese soup?! I just found cheddar! Do you put the sharp cheddar in the recipe or just on top? I would think so…. But not sure on that one. Sure….nothing in it that won’t freeze well. Thank you! The condensed soup was actually not that bad…. until you get to the margarine part in the ingredient list. Oh My Goodness this soup is sooooo good. Just made it and everyone loves it. Thanks for sharing the recipe. Just made this soup to eat while we watch football!!!! I used ground turkey and 1/2 pound chorizo instead of the ground beef. OMG!!!!! This is the easiest and best tasting “fast “soup I have ever had! Thanks!!!! It sounds so good,we love homemade soups in the winter time.Thank you so much. 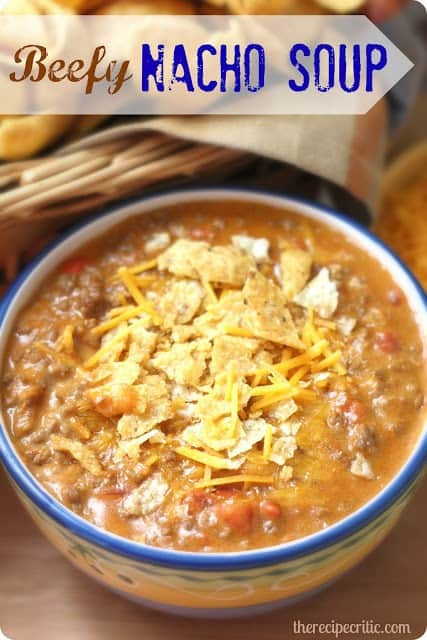 We ordered taco soup in a restaurant one time & it was so good…a lot like this only they used chicken & white beans. Served fried tortilla strips with it & it was so good. I copied it at home & it was delicious!!! I plan to make this tonight. The thought of adding the black beans and corn sound like great additions. For those wondering, Campell’s has the Fiesta Nacho Cheese flavor that I picked up specifically for this recipe. This looks perfect for a warm day! Pinned! I made this tonight it was delicious!!!! It’s simple, quick, and easy! Wow!!!!!!!! Love this! I use just petite diced tomatoes, the rotel type seems to spicy for my son. I add can of tomato paste and rinsed pinto beans. 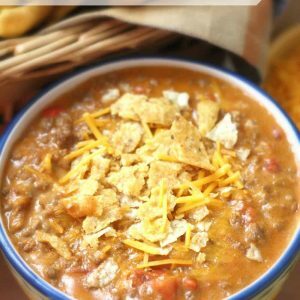 THIS recipe is his favorite soup I make! Thanks so much.